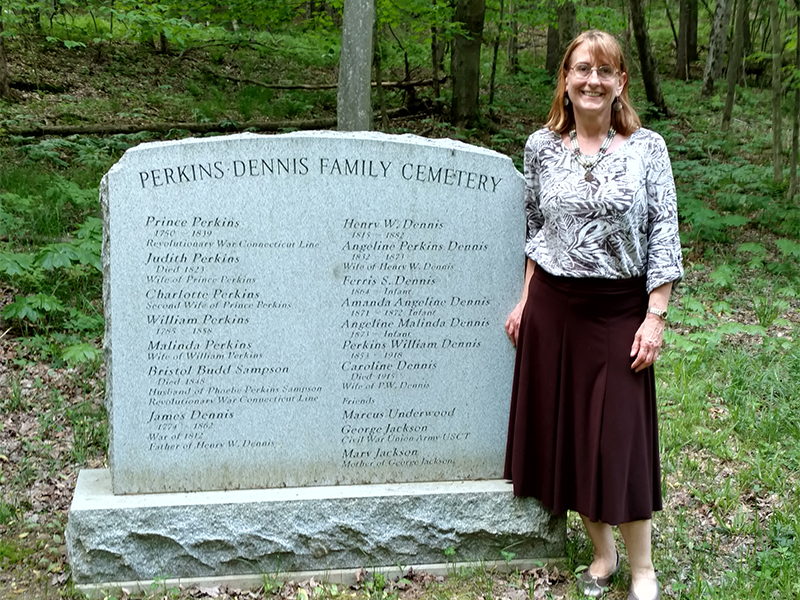 Endless Mountains Heritage Region Executive Director, Annette Schultz, stands next to Perkins-Dennis Cemetery monument during a field trip to the farm, May 2017. Through our membership in the Endless Mountains Heritage Region, Inc. (EMHR), DFCLT has received a grant from the Pennsylvania Department of Conservation and Natural Resources (DCNR), matched by DFCLT, to create an interpretive plan for the site. In May, EMHR Executive Director, Annette Schultz, toured the Dennis Farm with DFCLT Board member, archaeologist Wade Catts, Kathy Hughes, creative services director of the Geckogroup, and architect Phil Yocum of the Commonwealth Heritage Group who are working on the DFCLT interpretive plan. The Endless Mountains Heritage Region, Inc. is one of twelve heritage regions within DCNR’s Pennsylvania Heritage Region Program. It serves Bradford, Sullivan, Susquehanna and Wyoming Counties, home to some of of the Commonwealth’s most scenic rural landscapes that have been shaped by farming and timber over more than two centuries. In addition, EMHR serves as the water trail manager for the Susquehanna North Branch Water Trail, a national recreation trail and official gateway to the Chesapeake Bay Gateways Network. The EMHR theme “Living with the Land” echoes its mission, which is “to maintain and enhance the unique rural character and cultural heritage of the Endless Mountains.” When DFCLT was founded, EMHR and DCNR immediately offered their support, providing a grant for the feasibility study that became the blueprint for preserving the farm and developing it into a cultural heritage site. We appreciate EMHR’s and DCNR’s continued support and look forward to working together on future projects. Preliminary drawing of Dennis Farm Conceptual Plan, P. Yocum, Architect, 2017.